If you’ve been following us for a while, you know that my family is all about popcorn. Since I had some leftover Wilton melting chocolates from a few other projects, I needed to whip up a batch of Easter Bunny Trail Mix. There are no wrong or right measurements for this recipe. Add as little or as much as you’d like! The directions are pretty simple. If you are using fresh popped popcorn, make your batch and let it cool for a few minutes. I sifted through to make sure I got most (and hopefully all) of my old maids. If using multiple colors of melting chocolate, separate your popcorn into it’s own bowl for each color. Because I used 3 colors, I had 3 bowls. Grab a handful of pretzels and “crunch” them up in your hand before adding. Grab a handful or two of peanuts and add them. Pour in your chocolate candies (we used M&Ms but you could use Reese’s Pieces or any chocolate candy really). Melt the chocolate in the microwave in a microwave safe bowl (glass works great) for 30 seconds at a time. Mix and repeat until fully melted. Pour each onto wax paper and allow to cool. Our mixture is made of pink, blue and orange. Do you like the sweet salty mixture? Would you add anything different? This is so cute and a wonderful dessert to make for Easter. I like how it looks and how easy it is to make. I would like to make this with my niece next week when she visits. I like the Sweet and Salty flavors together. This looks so festive, what a fun snack to make. Will have to make some. I love the spring colors in this mix. Thanks for the recipe. I only like salty so I wouldn’t make this one for myself . It’s really pretty and would be good to take to a friend’s. This looks really good. We are big popcorn eaters in this house too and I think this is going to go over really well with the kids. I never even thought of making something like this. Thanks for the great review. I love this recipe and the grandkids are going to love helping me make it. It’s something fun we can do together. I love the colors. This would be great for my girls to make. Thanks for sharing. Looks delicious and so festive! I love the colors. Thank you for sharing. Looks delicious! I love the idea of using different colors of melting chocolates. i love this, i am a big trail mix person. i would add some dried fruits and seeds as well. 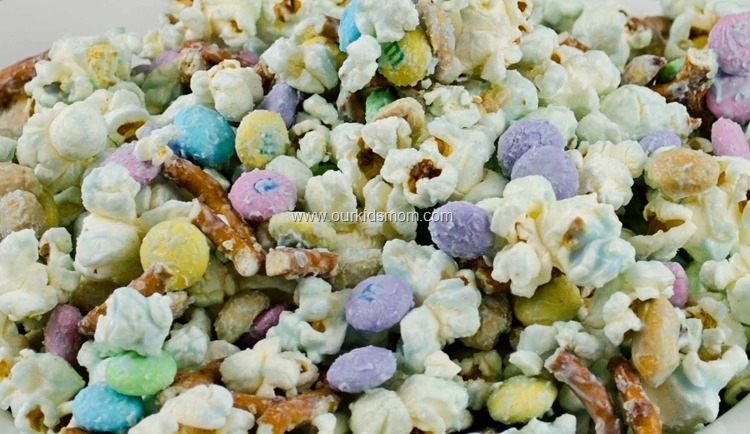 the colored popcorn makes it very easter like. 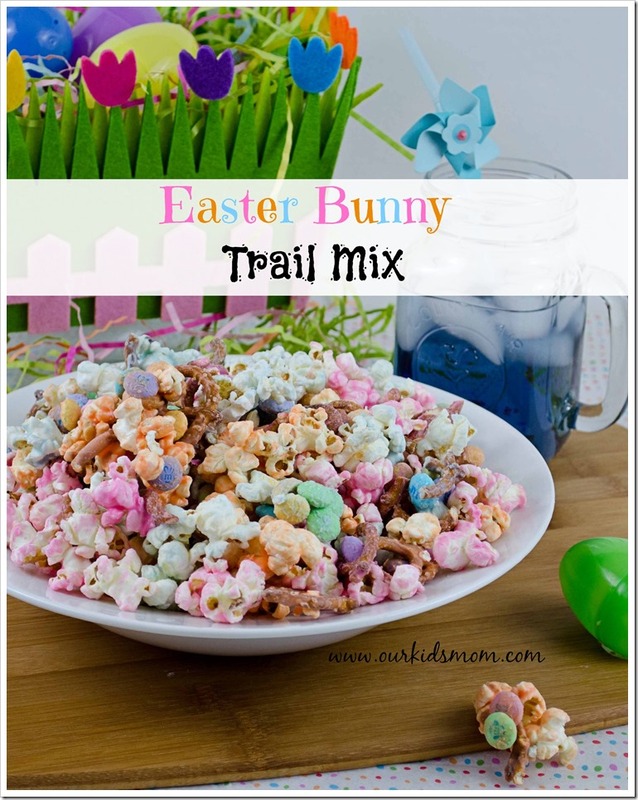 This looks so delicious and I want to make this Easter bunny Trail Mix with my niece and nephew. I think it is a fun colorful treat! I love trail mixes, so this one looks especially yummy. Thanks for the great idea this year at holiday time. That’s fun with the different colors of bunches of stuff. I’d go light on the chocolate since I like more salty than sweet. So much fun! I will add this to my Easter Brunch for the grandchildren. Thanks for sharing. Yum! We make a snack mix similar to this one. The kids love it!